Ocean Business is being held at the National Oceanography Centre in Southampton, UK from 9-11 April 2019. Firmly established as one of the most important international events in the ocean technology calendar, Ocean Business is FREE to attend and is expected to attract more than 5,000+ visitors from over 60 countries. At the very heart of Ocean Business is a three-day exhibition of over 360 companies, bringing together the world's leading manufacturers and service providers in the industry. 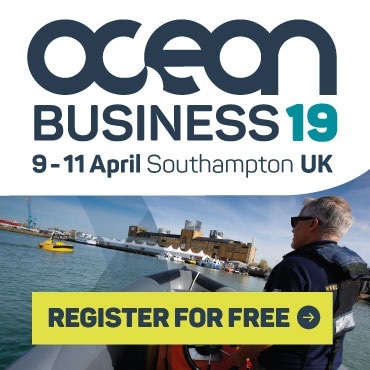 More than just a static exhibition, Ocean Business 2019 provides visitors with an opportunity to test-drive equipment and systems, with over 180 hours of live, free to attend training and demonstration sessions, on vessels, at the dockside, in the test tank and in seminar rooms. In addition, Ocean Business offers a selection of associated events from several key organisations in the industry, a two day technical conference and Ocean Careers, a three day event providing advice on career opportunities within the ocean technology, marine science and offshore industries.